The STOCKMASTER® Overhead Work Platform will aid in the selection and inventorying of stock. It fastens to a standard lift truck and negotiates narrow aisles. 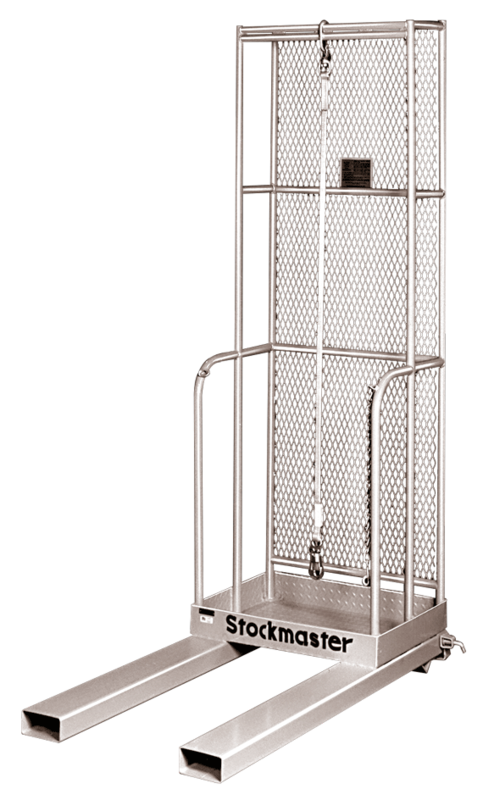 STOCKMASTER® gets the stock handler and pallet to overhead shelves for loading and unloading, and it’s durable construction ensures a long life of safe lifting. The STOCKMASTER® is equipped with a 6′ swivel fall protection lanyard mounted overhead to an 84″ tall back guard. A full body harness for personnel can be purchased separately. The 20″Dx30″W platform with a 4″ toe board gives the attendant room to stand with enough stacking space to handle a 42″ deep pallet.